August 9, 2014, part 1 of 2. August 9, 2014, part 2 of 2. Our guest today in the 2nd hour is Craig Isherwood, secretary of the Citizens Electoral Council. Craig and the CEC have been lobbying intensively for changes to financial regulations which would create a separation between merchant and commercial banks, to prevent depositors' funds being used for high risk investments like derivative trading. In our discussion Craig explains and elucidates some of the obscure "financial instruments" that are being used by merchant banks, and he warns us that a banking collapse in Australia is all but inevitable. In the first hour we bring you an investigation into the prejudice and delusion of the Australian and American public over what is happening in the Middle East and the Ukraine. June 28, 2014, part 1 of 2. June 28, 2014, part 2 of 2. In the 2nd hour of today's show we welcome Elisa Barwick from the Citizen's Electoral Council. Elisa is the editor of CEC's regular newsletter, and on today's show she gives us some insights into the situation with the world economy and some of the challenges which Australia faces. In our discussion Elisa provides an overview of the political philosophy of the CEC, and the solutions proposed by her party to some of the most pressing problems which face Australia right now. In the first hour, we take a look at some Australian news, with the main focus being the recent joint press conference between Clive Palmer and Al Gore, which has many political commentators around Australia scratching their heads. July 3, 2013, part 1 of 2. July 3, 2013, part 2 of 2. Craig Isherwood is the National Secretary of the Citizen's Electoral Council (CEC). The CEC recently launched a petition to the Commonwealth Parliament, calling for immediate legislation to enact a Glass-Steagall-style banking separation in Australia, to protect deposits and essential banking services from looming financial shocks. During our 2nd hour interview today Craig exposes the real threat to depositors' savings represented by impending changes to financial legislation. You can find out more about this topic on the CEC's dedicated information page. 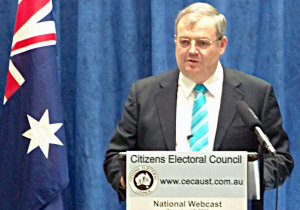 CEC Australia is a national political party, established in 1988 in Queensland. December 7, 2011, part 1 of 1. Tonight we welcome to the show Craig Isherwood, National Secretary of the Citizens Electoral Council. Craig describes the CEC as a "philosophical" political party with similarities to "old Labor" in the spirit of Curtin and Chifley. During our discussion, we examine some of the main concerns of the CEC, including the restoration of our national sovereignty, the nationalisation and regulation of ownership of shared resources, and the connections between Fabian Socialism, the environmental movement and the hidden agenda of the oligarchy to drastically depopulate the earth.